Exempt subject to maximum of Rs.14,000 per month for defraying services of an orderly and for secretarial assistant on contract basis. The value of residential telephone free of cost and the number of free calls to the extent of 1500 per month shall be exempt. Amount exempt from tax varies from Rs. 300 per month to Rs. 7,000 per month. Amount exempt from tax varies from Rs. 200 per month to Rs. 1,300 per month. (ii) which is located in remote area. 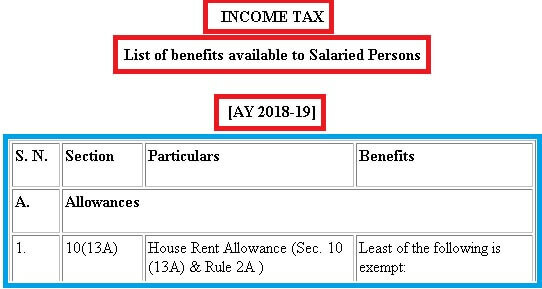 2) Rent free accommodation if provided to High Court or Supreme Court Judges, Union Ministers, Leader of Opposition in Parliament, an official in Parliament and Serving Chairman and members of UPSC is Tax Free Perquisites. 3) The value so determined shall be reduced by the amount of rent, if any, paid by the employee. i. Any amount recovered from the employee shall be deducted from the taxable value of perquisite. a) Perquisite value taxable in the hands of employee shall be expenditure incurred by the employer lessamount recovered from employee. b) Where such facility is maintained by the employer, and is not available uniformly to all employees, the value of benefit shall be taken to be the value at which such facilities are offered by other agencies to the public less amount recovered from employee. However expenses on telephones including a mobile phone incurred by the employer on behalf of employee shall not be treated as taxable perquisite. a) Hospital maintained by the employer. c) Hospital approved by the Chief Commissioner having regard to the prescribed guidelines for treatment of the prescribed diseases. 2) Medical insurance premium paid or reimbursed by the employer is not chargeable to tax. a) Expenses on medical treatment - exempt to the extent permitted by RBI. b) Expenses on stay abroad for patient and one attendant - exempt to the extent permitted by RBI. c) Cost on travel of the employee or any family or one attendant - exempt, if Gross Total Income (before including the travel expenditure) of the employee, does not exceed Rs. 2,00,000. Amount actually paid during the year is deductible. However, if professional tax is paid by the employer on behalf of its employee than it is first included in the salary of the employee as a perquisite and then same amount is allowed as deduction. Retrenchment Compensation received by a workman under the Industrial Dispute Act, 1947(Subject to certain conditions). ii. 15 days average pay for each completed year of continuous service or any part thereof in excess of 6 months is to be adopted under section 25F(b) of the Industrial Disputes Act, 1947. Note: Partial withdrawal from the NPS shall be exempt to the extent of 25% of amount of contributions made by the employee. If car is used wholly and exclusively in the performance of official duties. If car is used exclusively for the personal purposes of the employee or any member of his household. Expenditure incurred by the employer (i.e. hire charges, if car is on rent or normal wear and tear at 10% of actual cost of the car) plussalary of chauffeur if paid or payable by the employer minus amount recovered from the employee. Actual expenditure incurred by the employer minus Rs. 1800 per month and Rs. 900 per month if chauffer is also provided minusamount recovered from employee. Actual expenditure incurred by the employer minus Rs. 2400 per month and Rs. 900 per month if chauffer is also provided minusamount recovered from employee.